Do you want to encode your scripts "on-the-fly"? OR encrypt the HTML output of your existing PHP scripts? "Encode & Deploy - Your Way!" This script enables you to generate encrypted PHP scripts and it even encodes the HTML Output of your existing scripts! (in real-time)! Encrypt your own scripts on your server, in real-time on-the-fly for downloading OR while running! Runs in Real-time and online. You can include it within your own scripts as a function! In this mode you can specify a source file and a destination file, and run the Encoder as a real-time encoder. This mode will create an encoded PHP file of an existing PHP or HTML file, and you have the option of encoding the HTML Browser output! In this mode, you can place the encoder (with an include) at the top of any HTML or PHP page (must have a PHP extension). Then, the encoder will encode the browser HTML output of the current page in real-time. 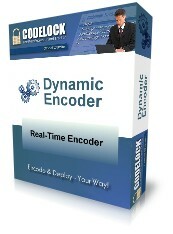 Simply put the dyncodelock.php file into the same folder as your files and you have a real-time PHP/HTML Encoder engine!